The world of nutrition has exploded in the recent years with an abundance of so-called superfoods, which are packed with a multitude of nutrients and offer numerous health benefits. Interestingly, a large portion of that spotlight is occupied by foods native to Peru, which - besides its natural and cultural beauty- is home to a number of herbs that have been recognized for their medicinal properties and nutritional profiles. Besides being famed as the Incan aphrodisiac, maca root can actually offer a lot more than increased libido and better sexual function. It has been found to naturally balance hormones, boost energy levels, and even relieve depression. So, if you need a nutritious punch to get your day going, look no further. Start your morning with a Brain-Boosting Cacao Maca Shake, or a batch of Healthful Maca Pancakes. Maca's nutty flavor goes perfectly with cacao and peanut butter, and it's capable of adding an interesting twist to your favorite desserts. If you like creamy and sweet desserts, you will love lucuma powder. It is made from a Peruvian fruit that - aside from being delicious - helps stabilize blood sugar levels and control blood pressure. Its low glycemic index is particularly appreciated by diabetics and dieters, who use it as a low-calorie sweetener. Once you start adding lucuma powder to cookies, smoothies, and many other desserts you might be hooked for life. Enjoy the delicate flavor and sweetness of this Peruvian fruit in a Delicious Pure Lucuma Shake, or a mouth-watering Lucuma Vegan Ice Cream, and revamp an all times favorite with this recipe of Lucuma Tiramisu, which can satisfy even the most diehard, traditional lovers of this Italian dessert. It is probably safe to say that chocolate is everyone's guilty pleasure. Irresistible as it is, processed chocolate is also packed with sugar. This is where cacao nibs step in. They are the purest form of chocolate, crushed into tiny, crunchy nibs are packed with antioxidants and minerals, necessary for a healthy brain, good mood, and energy. Cacao nibs have an enjoyably bitter taste and can stand up to the task of replacing chocolate chips in smoothies, cookies, trail mixes, and many other recipes. Kickoff the day with an Energizing Cacao Mocha Shake or a nutritious Cacao Nibs Peanut Butter Chia Pudding. Don't be deceived by camu camu's small size - these tiny berries are the most potent source of vitamin C. Adding them to your diet will also boost beta-carotene and potassium levels, not to mention precious antioxidants, all of which will improve your immunity, help you fight colds, and maintain good eye health. Camu camu powder's pleasantly tart flavor can add a refreshing touch to a variety of dishes, from your morning juices to sweet and tangy desserts on hot, sunny days. Try an Immune Boosting Camu Camu Smoothie and keep yourself vibrant for upcoming days. 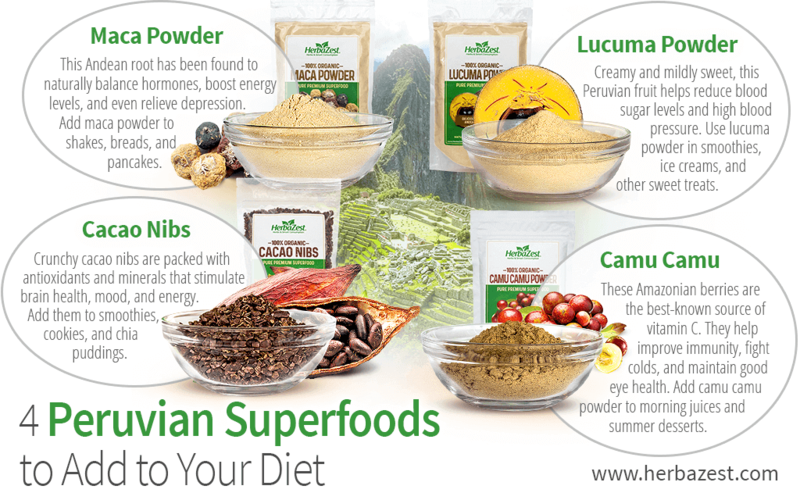 These four Peruvian superfoods are capable of triggering a real culinary revolution in your kitchen, adding an abundance of exotic flavors and essential nutrients. As science continues to reveal their properties, the arrays of their lovers around the world keep growing in size. Introducing them in a variety of healthy recipes will allow you to get a taste of magical Peru without taking a trip abroad.